Bob Monkhouse's critics called him bumptious, smooth and smarmy but, for more than 40 years, he was one of the most popular and assured performers on British television. Monkhouse, who has died after a two-year battle with prostate cancer, was born at Beckenham in south London in June 1928, his parents hoping he would go into the family custard business, the firm of Monk and Glass. But he began selling cartoons and jokes in his teens and at Dulwich College public school he met another comedy hopeful, Denis Goodwin. They teamed up to write material for comedians including Max Miller and Arthur Askey. Monkhouse was also writing and drawing strips for children's comics such as the Beano and the Dandy and, after leaving school, set himself up in business as the editor of his own publication. He commissioned artists and writers for his comic, paying them by postal order, and did all the production and distribution work himself. His days as a publisher ended when he was called up for service in the Royal Air Force and he returned to civilian life to earn a living as a radio gag writer and stand-up comedian. He appeared in revue with Benny Hill in the late 1940s and later broke into television, writing and appearing with his old partner, Denis Goodwin, who committed suicide in 1975. Bob Monkhouse's own life was darkened by tragedy. At the age of 20, he was disowned by his parents after marrying his first wife, Elizabeth. His mother turned up at the wedding in mourning black. He never resolved his differences with his father and only spoke to his mother in the months before her death. And in 2001 his 46-year-old son Simon died from a heroin overdose in a Thai guest house. He and his father had not spoken for 13 years. His other son, Gary, who had cerebral palsy from birth, died in 1992 aged 40. He was diagnosed with prostate cancer two years ago, and was given an implant in his stomach and a daily pill to allow him to keep working. Asked about his health, he joked: "I saw a specialist who asked me 'Are you familiar with the phrase faecal impaction?'. "I said I think I saw that one with Glenn Close and Michael Douglas." As well as his long career as a talented, slick comedian and occasional straight actor, Bob Monkhouse was probably best known as a host of popular TV game shows. He reckoned that, during his career, he had fronted more than 30 different programmes, including The Golden Shot, which ran for nine years. His other game show hits included Celebrity Squares, Bob's Full House, 64,000 Dollar Question and Bob's Your Uncle. He also compered the revived Opportunity Knocks talent show for the BBC, and found time for about 150 cabaret and speaking appearances each year. He was awarded the OBE in 1993. 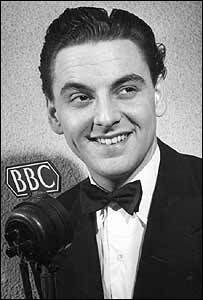 Always in his element playing to small, intimate, audiences rather than at large venues, Bob Monkhouse enjoyed improvising and was quite often near-the-knuckle. "When I said I was going to become a comedian," he once quipped, "they all laughed. Well, they're not laughing now, are they?"